As the 150th anniversary of the start of the Civil War approaches, most Americans say the war between the North and South is still relevant to American politics and public life today. More than half of Americans (56%) say the Civil War is still relevant, according to the latest national survey by the Pew Research Center for the People & the Press, conducted March 30-April 3 among 1,507 adults. Nearly four-in-ten (39%) say the Civil War is important historically but has little current relevance. In a nation that has long endured deep racial divisions, the history of that era still elicits some strong reactions. Nearly half of the public (49%) says it is inappropriate for today’s public officials to praise the leaders of the Confederate states during the war; 36% say such statements are appropriate. 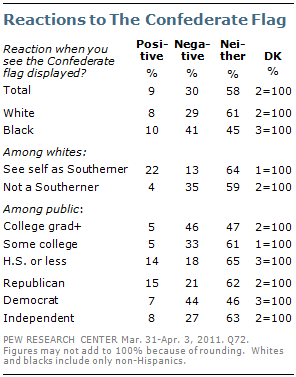 Nonetheless, a majority (58%) say they have no particular reaction to the Confederate flag, the symbol of the South. Among those who have a reaction to the flag, more than three times as many say they have a negative reaction as a positive reaction (30% to 9%). There is no consensus among the public about the primary cause of the Civil War, but more (48%) say that the war was mainly about states’ rights than say it was mainly about slavery (38%). Another 9% volunteer that it was about both equally. Young people are more likely than older Americans to say that the war’s main cause was states’ rights – 60% of those younger than 30 express this view, the highest percentage of any age group. Those 65 and older are the only age group in which more say that slavery, rather than states’ rights, was the main cause of the Civil War (by 50% to 34%). While 48% of whites view states’ rights was the war’s main cause, so too do 39% of African Americans. On some, but not all, issues relating to the Civil War, the views of whites who identify as Southerners differ significantly from those who do not. 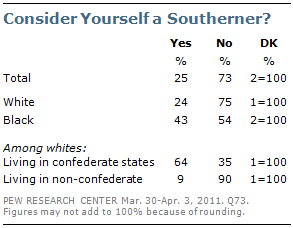 About a quarter of all whites (24%) consider themselves Southerners; 75% do not. Nearly half of self-described Southern whites (49%) see states’ rights as the war’s main cause; among whites who do not consider themselves Southerners, a comparable percentage (48%) also says states’ rights was the war’s main cause. However, self-described Southern whites are more likely than other whites to view praise by politicians for Confederate leaders as appropriate and to have a positive reaction to displays of the Confederate flag. 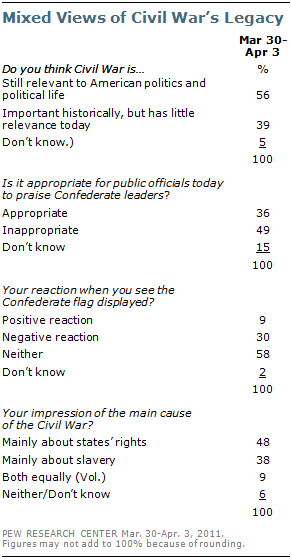 The public expresses a less positive view of politicians praising Confederate leaders than it did a decade ago. In a January 2001 Gallup survey, 50% said they thought it was appropriate for public officials to praise the leaders of the Confederate states in the Civil War; 40% said such praise was inappropriate. In the new survey, more think that politicians’ statements praising Confederate leaders are inappropriate rather than appropriate (by 49% to 36%). Whites who consider themselves Southerners are the only group in which substantially more view public officials’ praise for Confederate leaders as appropriate rather than inappropriate (52% to 32%). A plurality of all whites (49%) – and a clear majority of African Americans (60%) – say it is inappropriate for public officials to praise Confederate leaders. About six-in-ten (59%) among those with at least a college degree also say praising leaders of the former Confederate states is inappropriate, while 30% say they do not have a problem with that. Those with a high school diploma or less are divided (42% appropriate, 41% inappropriate). Only a small number of Americans say they display the Confederate flag, but that symbol of the Southern cause elicits more negative reactions from some groups – especially African Americans, Democrats and the highly educated. Nevertheless, most Americans say they do not react positively or negatively when they see the Confederate flag. Fewer than one-in-ten (8%) say they display the Confederate flag in places such as their home or office, on their car or on their clothing; 91% say they do not. The number that displays the Confederate flag is just a small fraction of the 75% who say they display the American flag in their homes or offices, on their cars or their clothing. Far more African Americans than whites have a negative reaction to the Confederate flag (41% to 29%). Still, about as many blacks have no reaction (45%) as a negative reaction to the Confederate flag. Among whites, 61% have no reaction. Whites who consider themselves Southerners have a more positive reaction to the Confederate flag than do other whites: 22% say they react positively when they see the Confederate flag displayed, compared with 8% of all whites and just 4% of whites who do not consider themselves Southerners. Nearly half of those with at least a college degree (46%) say they have a negative reaction to the display of the Confederate flag, compared with a third (33%) of those with some college experience and just 18% of those with a high school diploma or less. There also are partisan differences in reactions to the flag: about twice as many Democrats (44%) as Republicans (21%) react negatively to displays of the Confederate flag. And Republicans are more likely than Democrats to have a positive reaction to the flag (15% vs. 7%).